I must admit to having a soft spot for Barbirolli. My favourite practice venue at the Royal Academy of Music was the Barbirolli Room, where, if hours of scales and long notes seemed daunting, there was at least plenty to look at while blowing � the big fat cigar sent from Sibelius and now crumbling with age, the baton with its huge cork handle, medals, photos. After four years absorbing all these artefacts it was unavoidable that one would feel at least a slight affinity for the great man. The first of these recordings is of a live concert in the Hall� Orchestra�s home town of Manchester, and the stamp of quality is immediately apparent, despite the mono sound. We have become used to hearing Beethoven�s Symphony No.5 in the bruising tempi now favoured by conductors striving for authenticity, so that Barbirolli�s opening movement, while dramatic enough, sounds more stately than urgent. There is little pulling around of the tempo, and the crests and troughs of the music are pointed out with detailed and accurate dynamics. 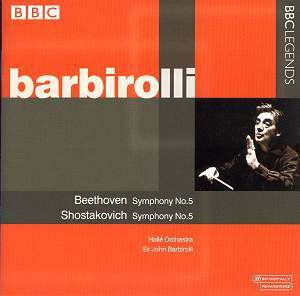 Barbirolli made one commercial recording of this symphony twenty years before this performance, but his view on the music appears to have remained consistent, the timings being almost identical between the two. I particularly like the second Andante con moto, which despite being measured in tempo is entirely in proportion, and has beautifully intonated winds, atmospheric strings and impeccably expressive phrasing. The performance is not without wit either � the working out of the theme toward the end of the third Allegro movement could almost be straight out of The Sorcerer�s Apprentice! The horns are let loose to great effect in the finale, and you can sense the enjoyment everyone is getting from performing. This is warm, respectful musicianship which at the same time revels in the liberty of having everyone at the top of their game. Barbirolli was, and still is better known for his all-round conducting prowess, but as Lyndon Jenkins points out in the booklet note, his work in the field of the contemporary music of his time formed a notable part of his repertoire, although sadly most of these performances went unrecorded. Barbirolli was apparently fairly reticent in his regard for the music of Shostakovich, but was convinced of its stature, and was happy for performances to be led by visiting conductors. Once committed to conducting a work himself, I can�t imagine Barbirolli taking on the task with anything other than complete devotion, and there is plenty of evidence for this in the present studio recording. The opening is sustained and tenacious, with full contrasts of passionate grit against elegant expression. As the performance goes on, you might wonder what is missing in comparison to other recordings from this period, but I found few points of weakness. All of the significant moments of drama and climax are right up there, and the only regret is that the recording is in slightly foggy mono, no doubt intended only for broadcast by the BBC. In this regard the 1965 recording by Andr� Previn with the London Symphony Orchestra will always be the winner. If there are any moments of doubt then it must be in one or two of the extended transitional passages, where the sense of direction can sometimes seem to go mildly astray. The moving Largo has depth and potent eloquence, and while there are one or two dodgy moments in the finale there is nothing which would make one reject this recording out of hand. The remastering on these aged recordings has been done sensitively and successfully. There is a modicum of tape hiss, but this is in no way intrusive, and most of the treble range seems to have been preserved. Climaxes and tuttis are fairly free from distortion, and the balance is good on the whole, with surprisingly full range in terms of dynamics and spectrum. There might be more significant recordings in terms of historical value,� but this issue can certainly be regarded as more than a mere cul-de-sac of the recorded canon. Barbirolli�s approach to Shostakovich is uncompromising and digs deep, and his Beethoven is honest and expressive � fans will not be disappointed.